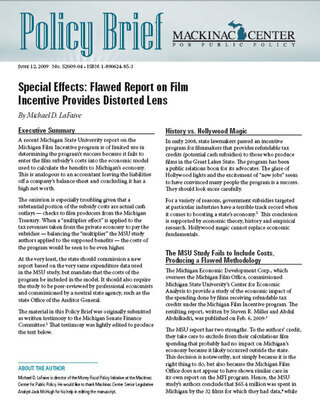 The MSU authors should have recognized that excluding the costs of the film incentive program leads to significant distortions. Economics 101 — not to mention common sense — teaches each student that everything has a cost, even if it is just an opportunity cost. This is one of the most fundamental precepts of economic science. The MSU authors may argue that leaving out the costs somehow does not invalidate their conclusions, but to do so, they would have to rebut an extensive body of economic literature that documents the misapplication of economic models. ... [T]o justify increased spending, government officials must identify some publicly desired goal to be accomplished by government spending. Creation of new jobs is among the best such goals that can be found. ... [T]hey must make it plausible that government can accomplish the goal in a way that the private sector cannot. This is where REMI is so valuable. It is a complex computer model that lay people cannot understand or evaluate, and it has important scientific merits. Thus, the frequent government claims that the best scientific model available shows that x thousand jobs will be created by the project helps to carry the day. In a 2005 book about business economics and finance, Lansing-area economist Patrick Anderson made a public plea for ethics in economic impact analysis, arguing, "Because the claimed economic impact of a proposed development can affect political support for a proposed project — and sometimes taxpayer funding — an incentive often exists to exaggerate the benefits." Whether intentional or not, a simple way to exaggerate benefits in an impact analysis is to exclude the costs. In a 2006 academic paper "Economic Impact Studies: Instruments for Political Shenanigans?" John L. Crompton argues: "Most economic impact studies are commissioned to legitimize a political position rather than to search for economic truth. Often the result is mischievous procedures that produce large numbers that study sponsors seek to support a predetermined position." Crompton goes on to specifically criticize ignoring total costs, omitting opportunity costs and abusing multipliers. The study, published in the Journal of Travel Research, focuses primarily on tourism-related impact analysis. Many of its arguments against impact analysis, however, apply to analysis of other "economic development" programs. In fact, Crompton's critique of tourism analyses is directly relevant to the MSU paper, which, among other things, cites film-related tourism as a benefit of the subsidies. Members of Michigan's tourism industry have seized upon this to trumpet the film incentive program's alleged virtues.